Mixing MoO 1 and 2 -- How would you do it? That's an interesting thread! I love to hear other people talking about the advantages and disadvantages of races in MOO1 because it gives me some insight into how other people play and evaluate the game. A lot of that thread quickly devolved into how to "balance" the existing races, which is something that I have absolutely no interest in doing. Although MOO1 is a sandbox in the sense that everyone starts with one planet and an unexplored map, having different strengths for the races creates an asymmetric dynamic that brings value to the game. In a single-player game, there's nothing inherently wrong with some races being more powerful than others. In fact, I would suggest that it adds depth to the game. This is true only if the playstyles actually differ. Mrsshan are not only a weak race but their theoretical bonuses don't really influence playstyle at all. Its fine if a weak class plays differently as noted by the silicoids and darloks. Neither of those are particularly strong but at least they interact with the game in a different way. For single player I definitely agree that uniquness trumps balance. When it comes to multiplayer, any thoughts of creating a really bland race for balance purposes? You know, average on all research/spying/diplomacy etc. Allow multiple players to be this same race. It certainly isn't exciting but would give a starting point for balancing multiplay in the future. I've updated a few more sections on possible ways to generate tech-trees through in-game actions and a section on how multi-planet systems could work as a system 'feature' (like rich/artifacts). I'm leaning more towards removing buildings and focusing more on leaders. Their might be situations for the occasional 'wonder-like' construction project. These would be limited to 1 per planet and 1 per empire. While MoO 1 improvement suggestions are still on topic, pollution mechanic could use some work. Pollution management technologies were great way of improving early game economy but by midgame they became efficient enough to let player ignore the whole mechanic. I'm not against mechanics getting turned off by technological progression, it just that I felt pollution management should stay relevant longer and there should be a reason to research late "eco restoration" type of techs. How to achieve that? I'd don't know, by making waste pile up faster with higher robotic control or something. Industrial waste elimination is a pretty ridiculous tech and I don't really like that it removes a mechanic from the game for all planets. This is why i think *some* buildings (like half a dozen) could see some use in MoO1 mechanics. (soil enrichments are another). Some sort of way of doling out the technology to your planets in a prioritized way. Whether that be through up-front costs, a new resource, or limits on the number of times you can enrich/eliminate planets. Slightly on topic, what do you guys think of having factories pollute whether they have people to work them or not? Currently factories only pollute while a population is present to run them. I'm trying to figure out if changing it so that factories always pollute is an interesting mechanic that makes pollution control have more impact on your decisions to 'max out' a planet's factory system. Open question: Are MoO2 command points necessary in MoO1 ship economy? In other words, do they belong in a 1.5? There is certainly a role of fleet maintenance which takes a chunk out of your production. MoO1 has this as a linear relationship that starts charging you for your very first small scout (I think) where MoO2 is a hinge that only kicks in at a certain point that the player can inadvertently influence. Both have some issues. MoO2 encourages having a 'standing' fleet because it is free. This (arguably) encourages earlier combats with other races. Whereas you are paying for a ship no matter how many you have in MoO1. This usually results in me building fewer ships until I really need them. I think this issue goes in favor of MoO2. Perhaps there should be some slack of free ship maintenance before costs kick in? MoO2 lets race traits and buildings effect this slack. Hmm... I don't think we need that. Maybe some races build ships faster and pay overall less for them when they are charged. But I'm not sure it is worth the hassle of having a dynamic limit before charges go into effect. MoO2's command points also quickly phased out effectiveness of smaller ships because their power/cp ratio was so bad. I actually think this is a weakness of command points (but necessary due to the clunky battle behavior). MoO1.5's system would rate ships equally based on size so that 1000's of smalls are still an option. (small, medium, large, huge). Summary: MoO1 style of paying maintenance for ships but only after a certain limit is reached. That limit is likely defined by size of galaxy and turn number. The amount paid in maintenance is not marginally cheaper for larger ships so that all ships sizes remain viable. You want waste elimination to become a non-factor by the midgame because you need to transition the player's attention from inward (developing his empire) to outward (dealing with other empires). How do you grow population in DG with no eco slider? I certainly agree that a positive feature of elimination is the ease of handling sliders. However, that can be covered by slightly more intelligent locking systems that let you set a minimum threshold of clean but not necessarily locked on the positive (right hand) direction. The reason the latter two are separate is that "Terraforming" basically adds to the max population, while the fertility-changing actions both affects max pop and fertility, but it's a lump action, no partial progress, unlike Terraforming that can be partial. Note that sliders are invisible until they can actually be done. So if you don't have terraforming techs, or already terraformed to current level, the Terraforming slider will be hidden. Same with Shield, Cloning, Factories, and other sliders. The only three sliders that are permanently visible are Starport (building Starport itself, or building ships), Missile Bases, and Research. So when you click on a planet, you can easily tell from a quick glance what the planet has and hasn't developed based on which sliders are visible. I think factories is missing from this list is what I meant. I see it in the picture, thanks. About the tax slider. If that was set to 0 (default behavior) it is equivalent to leaving the planet alone. If that was set to the largest possible (production amount) then that is equivalent to using the "Planets" screen transfer option and sending the maximum 1 turn amount, correct? It just does this every turn automatically? Edited by Moo4, 07 April 2016 - 11:59 AM. Correct, if slider is at 0, it does nothing. Anything above that is % of the planet's production draw from reserves (but if there's not enough, it divides the remaining reserves among planets proportionally). If there's 0 reserves, then it does nothing. If it's negative, it is similar to MoO 1's global tax slider, but instead of being limited up to 20%, it can go up to 100%. If it's at 100% tax, then no production is done. Yes, it has the same penalty, in that half production goes into reserves, and the other half lost due to corruption. 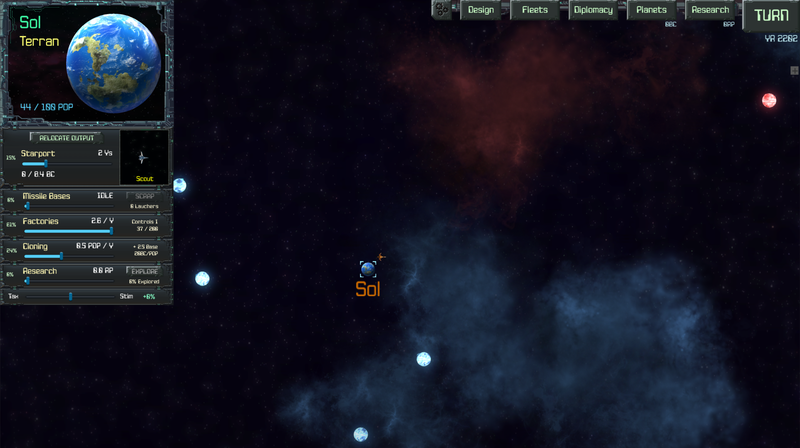 However, this is not "global", each planet can have different tax/infusion slider values. Edited by Zeraan, 08 April 2016 - 02:58 AM. "Production" is calculated before rich/poor multipliers I'm guessing? I'm not sure how I feel about a) non-uniformity of taxes across planets and b) ability for single planets to exceed 20%. In fact I think the argument that you can set it per planet should make the per-planet max lower than 20 instead of higher. The combination really just magnifies rich/artifacts in pretty scary ways. Have you considered lowering the max (to ~10ish) and then maybe allowing leader traits to increase that on a per planet basis and/or decrease the 2:1 overhead. 100% potential off the bat is... scary? Shrugs. Edited by Moo4, 08 April 2016 - 06:49 AM. Yes, production is calculated before bonus modifiers for different sliders. I.e. ultra rich/poor won't affect either the research or terraforming/cloning. Artifacts only affects research. Fertility only affects terraforming and cloning. In MoO 1, you could have a planet put 100% of its production towards reserve by sliding the IND slider all the way to 100% after you've built all the factories. It'd deduct the pollution cleanup, and rest is put into reserves at 2:1 ratio. We've essentially done the same thing, but prevented the exploit where you could invest into ultra rich planet to double its production, and reap the reserve infusion back. In fact, this is exactly how you did it in MoO 1, by putting 100% of production towards reserves on an ultra rich planet. The exploit was that normal bonus is 3x normal production, so infusing reserves doubles this to 6x. If you have 10 production, it'd give you 15 in reserves, and if you invest 10 extra production, it'd give you 15 more. This is prevented by simply forcing you to either invest or tax, but not both at the same time. Things are subject to balancing at a later time. While having races that's not equal in power makes things interesting, game-breaking balance issues aren't fun. This tax/stim slider is separate from global controls you will see in planet list screen. I'm looking forward towards Zeraan's project being made available. If an Alpha or Beta becomes available like an EA I'm ready to put my money down and sign up. Even if I "have" to do it thru Steam! Edited by JosEPh_II, 13 April 2016 - 05:25 PM. I don't really want to get into combat in this thread (at least I haven't written about it in OP) but I left a long-ish post on the DG forums about combat. Can you comment on the (unnecessary) role of critical hits and critical damage?